Samsung started to rolled out the Android Lollipop update for Galaxy Note 4 in last February. Now, the Samsung Galaxy Note 4 Android Lollipop update is being available in more and more regions. 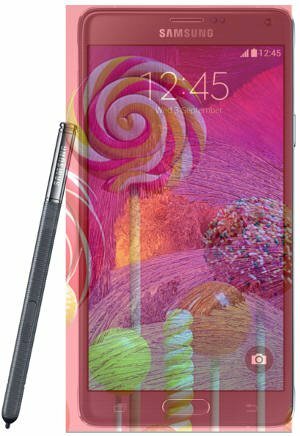 Just like any other Android update, some owners enjoy the improvement and new features in Galaxy Note 4 Android Lollipop update; some hate the update. Android Lollipop is a major update. There are many new features and improvements in Galaxy Note 4 Android Lollipop update. Of course, there are a few new bugs….. This post is trying to answer your questions on Galaxy Note 4 Android Lollipop update. It also applies to Android Lollipop update for Galaxy Note 3. Please let us know your question in the comment section if your questions or problems are not covered in this post. 1. Top 4 new features in Galaxy Note 4 Android Lollipop update? First, Samsung did not implement all new Lollipop features in Galaxy Note 4 Android Lollipop update. This happens to Galaxy S5 Android Lollipop update, and even in Galaxy S6 and Galaxy S6 edge. Also, in different regions, Galaxy Note 4 Android Lollipop update may have slightly different base version. Most are at Android 5.0.1. Some are at 5.0.2. Galaxy Note 4 Android Lollipop update brings a refreshed (not overhauled) TouchWiz user interface. The new interface is only partially following Google material design guidelines. However, the bolder color arrangements (e.g., different main colors for different apps),and fluid animation effects, should (arguably) delight some Galaxy Note 4 owners. Floating action button was added in various Samsung applications so that it is easier to perform a specific action, e.g., adding a new event, or composing a new message. Of course, Android Lollipop 5.0 (sorry not the latest 5.1) powers the Galaxy Note 4 Android Lollipop update. It is arguably faster than KitKat for almost all apps due to the new ART runtime, not the old Dalvik. It should also give longer (arguable!) battery life because it is more efficient in many tasks. trusted devices (Bluetooth or NFC). When your Galaxy note 4 is connected to such devices, it will be unlocked. trusted locations. When Galaxy Note 4 is located in these locations, the phone will be unlocked. trusted voice. You can use OK Google Hotword to unlock Galaxy Note 4 if the voice matches yours. On-body detection. You only unlock your device once. Galaxy Note 4 will stay unlocked as long as you keep holding or carry it with you. Samsung did not implement another smart lock, trusted face, in Galaxy Note 4 Android Lollipop update, possibly due to some conflict with the smart stay feature in TouchWiz. Please check this guide on how to use smart lock on Galaxy Note 4. In Galaxy Note 4 Android Lollipop update, Samsung combined the old blocking mode with Android Lollipop’s Downtime. It is renamed as Do Not Disturb. This essentially is Android Lollipop Downtime with a few teaks. If you were a user of the old Blocking mode, you will be very happy with this new Do Not Disturb. You can customize it and schedule it easily. You may check this guide on how to use the new Do Not Disturb in Galaxy Note 4 Android Lollipop update. Another nice feature of Galaxy Note 4 Android Lollipop update is the ability to set priority and privacy for notifications on lock screen. Block. This will turn off notifications from this app. Priority. There are two usages. In the notification panel, the app notification will be on top of other apps’. In Do Not Disturb mode, you can enable the notification from this app as an exception to pass through. Hide sensitive content. The contents of the notifications from this app will be always hidden on lock screen. This will overwrite the Show contents setting for this specific app. 2. Why my Galaxy Note 4 is too slow after applying Galaxy Note 4 Android Lollipop update, and how to solve the problem? First, Galaxy Note 4 Android Lollipop update should NOT be slow. Although TouchWiz is still bloated, Galaxy Note 4 Android Lollipop update normally should bring you a faster Galaxy Note 4. The slowness or lagging in Galaxy Note 4 Android Lollipop update is usually caused by leftovers of the old settings and app files in the cache partition. After rebooting Galaxy Note 4, if you still feel the phone is slow or lagging for most apps, you may try two solutions. Solution #1: Clear cache partition. Most of the problems can be solved by clearing cache partition following Galaxy Note 4 Android Lollipop update. The good thing of clearing cache partition is that it does NOT affect your own files or settings. It is safe for your data. You need boot your Galaxy Note 4 into recovery mode to access the clear cache partition option. Please follow this guide to reboot Galaxy Note 4 into recovery mode, then wipe the cache partition. If wiping cache partition does not solve the slowness problem for Galaxy Note 4 Android Lollipop update, you need try Solution #2. Please note, clear cache partition does NOT increase your internal storage, because cache partition is a system reserved separate partition. Solution #2: Factory data reset. If the slowness problem in Galaxy Note 4 Android Lollipop update cannot be solved by wiping cache partition, you probably have to try factory data reset. Factory data reset will erase all your data and apps. You will get a “new” phone in factory state. So, backup, backup, backup your data and files. You can use Kies 3 to backup most data into PC. Once you backup all your data, you can do a factory data reset in Settings—Backup and reset — Factory data reset. Please note, factory data reset will NOT bring you back to KitKat. You will still on Lollipop. If you really want to roll back to KitKat after Galaxy Note 4 Android Lollipop update, you need visit local Samsung service center. They may help you flash back the old ROM. Do NOT do it yourself unless you want to brick your phone. 3. How to solve battery problems after applying Galaxy Note 4 Android Lollipop update? Again, Galaxy Note 4 Android Lollipop update should NOT give you poorer battery life than that before the update. But some Galaxy Note 4 owners may still get poorer battery life. Was the phone always awake? In Settings—Power saving, tap the graph. You can find whether the phone was always awake. If it is always awake, reboot your Galaxy Note 4. Which apps are draining the battery? In Settings—Power saving, scroll down. You can find a list of apps that contribute to battery usage. If the battery problem persists on Galaxy Note 4 after the Lollipop update, you may also consider to clear cache partition as mentioned above. You may also check this battery guide on how to maintain Galaxy Note 4 battery (it was written for Galaxy S5, but it is applicable for Galaxy Note 4 as well). 4. How to install Flash player on Galaxy Note 4 after Galaxy Note 4 Android Lollipop update? Android Lollipop completely removed Flash support. But you can still enjoy Flash-powered contents with third-party browser and the official Flash Player app on your Galaxy Note 4. The simplest solution to add Flash support to Galaxy Note 4 Android Lollipop update is to use FireFox for Android + official Flash Player. Please follow this guide to install Flash player on Galaxy Note 4 after Galaxy Note 4 Android Lollipop update. 5. Where is the recording mode in Camera app in Galaxy Note 4 Android Lollipop update? Galaxy Note 4 Android Lollipop update brings an updated Camera app. The new Camera app does perform better in most scenarios, especially in low-light conditions. But one annoying change is the removal of video recording mode. The smooth motion mode and MMS mode are removed in this update. The fast motion recording mode and slow motion recording mode are now moved to Modes directly, not under camera settings. 6. Where is the Guest User and multi user modes in Galaxy Note 4 Android Lollipop update? Galaxy Note 4 Android Lollipop update does not bring a “genuine” Android Lollipop. This happens to even Galaxy S6. I actually think this is one of the 6 defects in Galaxy S6. Guest mode and multi-user support are NOT implemented in Galaxy Note 4 Android Lollipop update. The rumor is that guest user and multi-user support will be available in Android Lollipop 5.1 update. 7. Where can I find the updated Galaxy Note 4 user manual in my own language for Galaxy Note 4 Android Lollipop update? You can find the updated Galaxy Note 4 user manual for Galaxy Note 4 Android Lollipop update in this page. They are in various languages and are all in PDF format. Do you have any questions or problems on Galaxy Note 4 Android Lollipop update? What’s you thoughts on this Lollipop update for Galaxy Note 4? Please let us know your questions or thoughts in the comment box below. In kitkat camera at the top right of the screen where the recording time was it would also show the live file size and remaining space on sd card… since updating to lollipop this has disappeared and i just see the duration of tbe video. I want this feature back, where is it? No idea. The feature was removed from Samsung camera app. Oh damn, so it wasn’t an android issue, it was a samsung issue? Only happened when I updated to lollipop in any case. Is there any camera apps out there that would give me that functionality? It was nice to be able to say “oh crap this video is a bit big I better stop filming”. Not sure about which camera app has this feature. but I remember some may have. Well looks like the lollipop update completely ruined Adobe Flash player support on my Note 4 since I updated to it. Before the update, when I was on kitkat, it was working perfectly fine. After updating to lollipop, flash player on dolphin and firefox does not work. It freezes and crashes after a few seconds of playing. I uninstalled it and reinstalled it multiple times with no success. Same freezing then crashing problem. Im looking as other forums and other people have the same problem. (So far i have nothing positive to say about the lollipop update, haha. Honestly a whole list of negatives). In my galaxy note 4 the placing palm screen and turning over device is not working and my headphones 3.5mm jack was also not working properly. .
Did you turn on the mute feature in Settings–motion and gestures? For headphone jack, are you using the original Samsung headset? I have a galaxy 4 and recently I updated the system. Now everything like the list of contact names are listed on the right side of the screen. This goes for the to menu which shows wi-fi, battery level, date, etc. EVERYTHING is on the right side instead of the left. When I type dollar amounts i.e. 1234.11 it does 11.1234??? ?Please help! Very frustrated!!!!!! Do you mean all text is from right to left?